While feldspars are found throughout the world, they are rarely of gem quality. However, there is a very special feldspar variety known as sunstone found in south central Oregon. 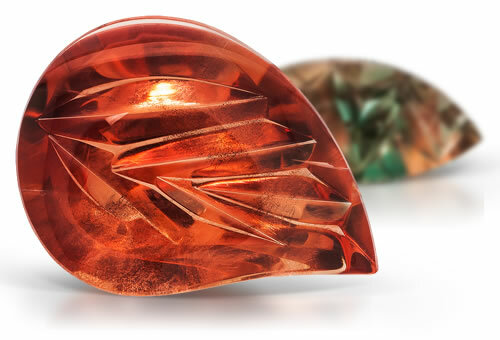 The Oregon sunstone is both gem grade and available in large enough sizes to yield cut stones for jewelry. The deposit is located in the region's rugged high desert where sunstone is embedded in ancient lava flows of an extinct volcano. As the lava weathers away or is broken up, Mother Nature releases the crystals for man to gather. RI, birefringence, optic character and magnification. Oregon sunstone contain tiny orange or yellow copper platelets or hematite platelets and stones might display adventurescence. Parting is common in this material.